What Shall We Wear? — Ginger writes. Anybody who has known me for more than five minutes has seen me in my button-up camouflage shirt from American Eagle. I was wearing it last spring when TJ and I went to Folly Beach to look for sharks' teeth. I was wearing it in October when I met my friend Blaire at Tandem for breakfast. I was wearing it this morning when I dropped Sailor off at preschool. I wore it to church this past Sunday and the Sunday before, and to the women's group last week and to go shopping on Monday. It has been a near-daily staple of my wardrobe for months on end, and God only knows how much tread I've made with that single $34.99 purchase. I wear it because I like it, but also because it's one of the few long-sleeve shirts I own. To say I've been desperate for clothes for a long, long time is an understatement. I once had a clothes stylist come help me do a closet assessment, and after seeing my closet, she said, "Where are your clothes?" I showed her my stacks of Old Navy tank tops and my couple pairs of pants on rotation, and my LeSportSac purse which I had been carrying for eleven years with no plans to stop. I worked with her long enough a couple years back to find some new Hue jeggings and a couple sleeveless blouses for church. But beyond those purchases, and the new purse TJ bought me, and a couple pairs of shoes here and there, I've bought very little clothing in the past few years. I wear what I like, and I like what I wear, until I finally can't take one more day of the camouflage shirt and force myself to go shopping. Miracle Hill lived up to its name this past Monday. I prayed before I went in, and evidently God was getting tired of the camo shirt too. I spent more than two hours in the store and tried on more than forty tops and a dress. 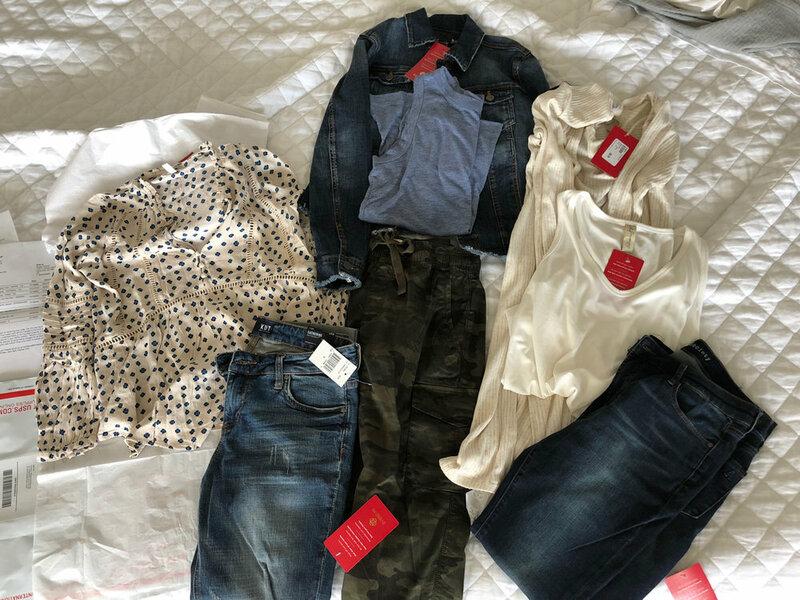 For less than $30, I bought two button-up shirts, a nice long-sleeve blouse, a sleeveless shirt, three cardigan-type sweaters, and the dress. I sort of couldn't believe my good fortune. Then the same afternoon, I came home to try on my first box of clothes from TrendSend (one of my "18 for 2018" goals for the year). I was shocked to find that every one of the eight items in the box was the right size and the outfits were cleverly arranged, with a note explaining how to wear the pieces together and on what occasions. The clothes looked cool, but several of the pieces didn't feel like me (one shirt was too hippie, one pair of jeans had rips in them, one cardigan was way too long). Oh, but they did include a pair of cool camo pants for...(get ready)...$119. Obviously TrendSend doesn't have Miracle in its name for good reason. But thanks to the Poshmark money I earned last fall and had earmarked for new clothes, and to TJ's advice on which pieces were worth keeping, and to the amazing savings at Miracle Hill, I proceeded with confidence to keep two items from the TrendSend box: a pair of skinny jeans with a cut-off hem and a dressy white scoop tank to wear as a base layer under some of the thrift store finds. I am happy that I completed my goal to try TrendSend, and even though I think the clothes are too expensive, it does seem like the service has something to offer in that they show you how to put clothes together and narrow down your choices for you. I am going to wait to receive one more box, for the fun of seeing the kind of outfits they recommend for me based on my style profile, and then I'll cancel my subscription. For the first time in a really long time, my closet a real choice of clothes in it. I kept exclaiming to myself all day on Tuesday how good it felt to wear a new sweater. As you might expect, I wore the same new sweater yesterday as well. It takes me time to acclimate to newness, to own the options, to enjoy the blessing, and to have courage to step out in something besides my camouflage shirt. And maybe one of these days, I'll even wear the dress.